Sir Richard (Williams) CROMWELL (1504 – 1544) (Wikipedia) was Alex’s 13th Great Grandfather, one of 16,384 in this generation of the Shaw line. Richard (CROMWELL) WILLIAMS was born about 1500 in the parish of Llanishen, in the county of Glamorgan, Wales. His parents were Morgan ap WILLIAMS a wealthy brewer in Putney and Catherine CROMWELL. the elder sister of Thomas Cromwelll. In 1518, he married Frances MURFYN. Richard died 20 Oct 1544 and is buried in Great St. Helen’s Church, London. Frances Murfyn was born in 1499. Her parents were Sir Thomas MURFYN (Wikipedia) who was that year Lord Mayor of London the year of her marriage and Elizabeth DONNE. Lady Frances died at Stepney, and was there buried on 20 Feb 1533. Huntingdon, England Joan WARREN about 1559 in Godman, England. He married second, Susan Weeks. 6 Jan 1603/04, Hinchingbrook Huntingdon, England and is buried in All Saints Church. Hinchinbrook House – Sir Richard (Williams) Cromwell purchased to great advantage the land of several dissolved monasteries including those of the nunnery at Hinchinbrooke. Richard changed his name from Williams to Cromwell because Henry VIII strongly recommended that the Welsh adopt the English practice in taking family names. The traditional Welch practice as to add their father’s, and perhaps grandfather’s name to their own Christian one with nap or ap, as Morgan ap William, or Richard ap Morgan ap William; (i. e. Richard the son of Morgan the son of William) The old system was also inconvenient in identifying persons in judicial matters. For these reasons, the Welsh, about this time, dropped the ap in many of their names; or, if it could be done with convenience as to pronunciation, left out the a, and joined the p to their father’s Christian name. Many Christian names were appropriated to families; for the reasons above “we have the Williams’s, Lewis’s, Morgans, and many others, and, by joining the p, the Pritchards (ap Richard), Powels (ap Howell), and Parrys, (ap Harry) . Thus Mr. Morgan ap William, Sir Richard’s father, seems, from the pedigree, to have taken the family name of Williams; but, as the surname of Williams was of so late standing, Henry VIII recommended to Sir Richard, to use that of Cromwell, in honour of his uncle the famous Thomas Cromwell, 1st Earl of Essex, who was one of the strongest advocates of the English Reformation, the English church’s break with the papacy in Rome. Cromwell helped engineer an annulment of the King’s marriage to Catherine of Aragon, so that the king could marry his mistress, Anne Boleyn. Our American ancestor, Giles Cromwell was a great-great-grandson of Thomas Cromwell’s sister, Katherine Cromwell. The former part of Richard’s life unknown: he was brought into the court of King Henry VIII by an alliance with Thomas Cromwell, the great favourite of Henry; whom that monarch raised from an humble situation, to be Earl of Essex, Vicar-General, and Knight of the Garter. Richard was introduced to King Henry VIII, by Thomas Cromwell, and soon was enjoying the royal bounty, which Henry lavished upon all who were his favorites. It is certain that Richard stood so high in that monarch’s esteem, that he was entrusted with some considerable appointment very early in Thomas Cromwell’s administration. By a letter he wrote to lord Cromwell, it appears that he was very active, and probably instrumental, in suppressing the Pilgrimage of Grace,a popular uprising in York during 1536, in protest against Henry VIII’s break with the Roman Catholic Church and the Dissolution of the Monasteries, as well as other political, social and economic grievances. During the Dissolution of the Monasteries, Sir Richard was appointed one of the Visitors of the religious houses; his zeal in the cause of both the sovereign and the minister, met with an ample reward. Perhaps Thomas finding himself in a precarious situation as the favourite of the most fickle of princes, was happy to raise up one of his family to assist and support him. 8 March 1537/38 – Thomas Cromwell had the grant of the nunnery of Hinchinbrook, in Huntingdonshire, for only £19. 9s. 2d. as stated in the deed. Obviously, this monastery to was very much undervalued. The grant states the lands and premises given to Sir Richard as lying in the several parishes and hamlets of Hinchinbrook, Huntingdon, Stewkley-Magna, Stewkley-Parva, Turkington, Houghton, Esington, Auconbury, Paxton-Magna, Paxton-Parva, Hale-Weston, Warensley, or Wiresley and Bawynhoo, all in the county of Huntingdon; Eltisley, Botesham, and Boxworth, in Cambridgeshire; Staplewe, and Bewlow, in Bedfordshire; Hamildon-Parva, in Rutlandshire; and Stoke-doyle and Okeley, in Northamptonshire. 9 April 1539 – Richard received for the trifling sum of £1 0s. 5d. 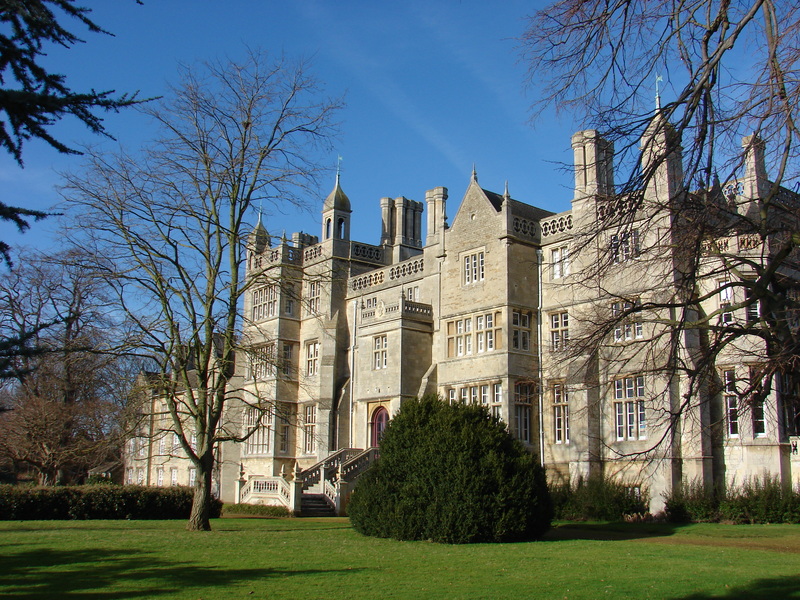 a grant of certain premises, lying in Eynsbury, Eton, and Little-Paxton in Huntingdonshire, belonging to the late dissolved chantry of Swasey, in the county of Cambridge. Chantry is the English term for a fund established to pay for a priest to celebrate sung Masses for a specified purpose, generally for the soul of the deceased donor. Chantries were endowed with lands given by donors, the income from which maintained the chantry priest. These were very considerable places but in the same year he had a grant from the crown of the abbey of the Grey-Friars, in Yarmouth, in Norfok. 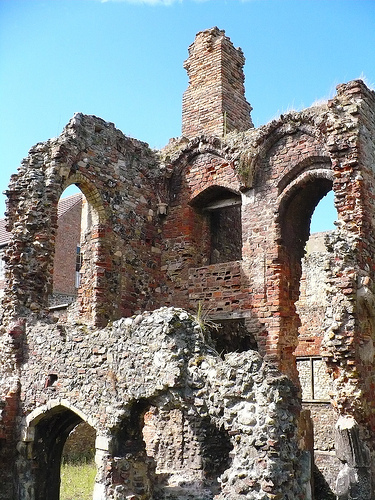 Ruins of Grey-Friars, Yarmouth granted to Sir Richard. Inside this ruined 13th Century Franciscan Friary are two stone-vaulted cloisters, two tomb recesses and some 14th-century wall paintings discovered in the 1960s. 4 March 1540 – Also the site of the rich Abbey of Ramsey in Huntingdonshire, with the several meers or lakes belonging to it, in the same parish; it is expressed in the grant, that it passed in consideration of his good service, and the payment of £4963 4s. 2d. to be held in capite by knights service. Considerable as this sum then was, it was trifling in comparison of the prodigious value of that abbey and the annual revenue amounted to £1987. 15s. 3d. A Prior and twelve monks formed the original foundation. The Abbey itself was then situated on a peninsula of gravel, known as Bodsey Island, with the impassable fen to three sides. The chapel was replaced by a large, stone-built church over the next five years and thus remained until the Norman Abbot created a much grander project in the 12th century. It was thought to have been founded by Earl Ailwyn (Æthelwine), an effigy of whom is thought to be within the Abbey dating from 1230. Considerable damage was inflicted upon the Abbey by Geoffrey de Mandeville in 1143; he expelled the monks and used the buildings as a fortress. At the time of the Dissolution in 1539 there were still 34 monks. In the order of precedence for abbots in Parliament, Ramsey was third after Glastonbury and St Alban’s. The abbey prospered until the Dissolution of the Monasteries. Stone from the abbey was used to build Gonville and Caius College, Cambridge, King’s College, Cambridge and Trinity College, Cambridge. The Abbey lands were sold to Sir Richard Williams (alias CROMWELL). 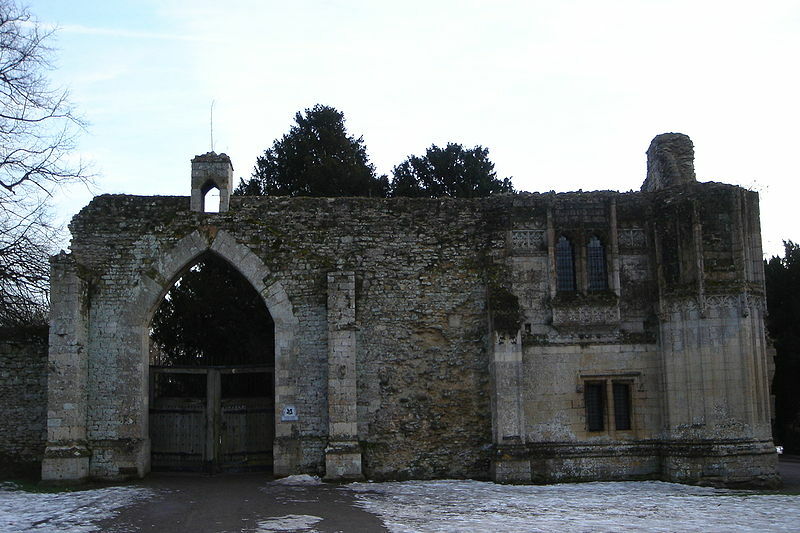 The Abbey Gatehouse (a National Trust property), the Almshouses, and the parish church can still be seen. 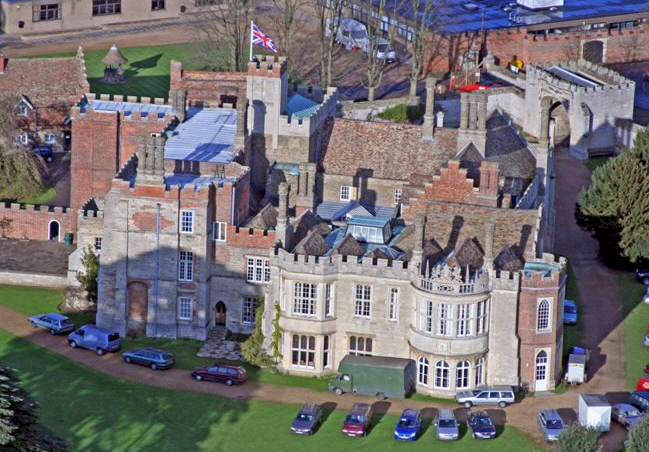 Part of the gatehouse was removed by the son and heir of Sir Richard, Sir Henry (Williams) Cromwell to form the main gateway to Hinchingbrooke House in Huntingdon, his newly build winter residence. The other grants, though many of them were not wholly free, were probably upon easy conditions. The dissolved religious houses were disposed of, for almost nothing; and Richard, we may presume, from his alliance with his uncle Thomas Cromwell (who had the disposal of these properties) had great favour shown him; especially, as he was beloved by the sovereign, and was a Visitor. (In 1534 Henry had Parliament authorise Thomas Cromwell to “visit” all the monasteries, including those like the Cistercians previously exempted by Papal dispensation, to purify them in their religious life, and to instruct them in their duty to obey the King and reject Papal authority. Cromwell delegated his visitation authority to hand-picked commissioners;including Richard ; for the purposes of ascertaining the quality of religious life being maintained in religious houses; of assessing the prevalence of ‘superstitious’ religious observances such as the veneration of relics; and for inquiring into evidence of moral laxity (especially sexual). The houses identified for suppression were then visited by a further set of commissioners charged with effecting the arrangements for closure, and empowered to obtain prompt co-operation from monastic superiors by the offer of pensions and cash gratuities. The property of the dissolved smaller houses reverted to the Crown and Cromwell established a new government agency, the Court of Augmentations to manage it; while the ordinary monks and nuns were given the choice of secularization (with a cash gratuity but no pension), or of transfer to a continuing larger house of the same order. Although it had been promised that King’s enhanced wealth would enable the founding or enhanced endowment of religious, charitable and educational institutions, in practice only about 15% of the total monastic wealth was reused for these purposes. About a third of total monastic income was required to maintain pension payments to former monks and nuns, and hence remained with the Court of Augmentations. This left just over half to be available to be sold at market rates Very little property was given away by Henry to favoured servants, and any that was tended to revert to the Crown once their recipients fell out of favour, and were indicted for treason so Sir Richard (Williams) Cromwell appears to be one of the few who became very rich. and that day sir John Dudley was overthrown in the field by mischance of his horse, by one Andrew Breme; nevertheless, he brake divers spears valiantly after that; and after the said jousts done, the said challengers rode to Durham-place, where they kept open household, and feasted the king and queen, with their ladies, and all the court. The 2nd of May, Anthony Kingstone, and Richard Cromwell, were made knights of the same place. The 3rd of May, the said challengers did Tourney on horseback, with swords; against them came 29 defendants: Sir John Dudley and the earl of Surrey running first, which the first course lost their gauntlets, and that day Sir Richard Cromwell overthrew M. Palmer in the field off his horse, to the great honour of the challengers. and the 6th of May the said challengers brake up their household. In the which time of their house-keeping, they had not only feasted the king, queen, ladies, and the whole court, as was aforesaid, but on the Tuesday in the rogation week, they feasted all the knights and burgesses of the common house in the parliament; and on the morrow after they had the mayor of London, the aldermen, and all their wives to dinner: and on the Friday they brake it up as is aforesaid. and thereupon dropped a diamond ring from his finger, which sir Richard taking up, his majesty presented it to him, bidding him ever afterwards bear such a one in the fore gamb of the demy lion in his crest. The fall and execution of Sir Richard’s uncle Thomas Cromwell, 1st Earl of Essex, in July 1540, did not (as might have been supposed) adversely affect his social standing, or private fortune. In 1541, Richard was appointed High Sheriff of Cambridgeshire and Huntingdonshire he was also returned a member for Huntingdonshire, in the parliament which began 16 January 1542. In this year Henry VIII likewise gave him a grant of the monastery of St. Mary’s, in the town of Huntingdon, and St. Neots, whose yearly values were £232 7s. and £256 1s. 3d. In 1543 Sir Richard was made one of the gentlemen of the privy-chamber, or, as he is styled in some grants, gentleman buisher, or usher of the chamber. A war breaking out with France in this year, he was sent over to that kingdom, as general of the infantry: all the officers for this expedition were selected, they being “all right hardie and valiant knights, esquires, and gentlemen”. Sir Richard besides the grants mentioned already, had given him the office of steward of the lordship of Urchenfeld, with the constableship of the castle of Goderyche in the Welsh Marches, and the power of appointing the master serjeant and porter belonging to those offices, during the nonage of the earl of Shrewsbury. He had also grants of the priory of St. Helen, in Bishopsgate street, in London; the castles, lordships, and manors of Manerbere or Maverbere, and Pennalle, both in the county of Pembroke, of the value of £100 to him and his heirs-male by knights’ service; and also by exchange for other lands, the abbey of Neth in Glamorganshire; which last he probably procured, because it lay so near his own birthplace..
Sir Richard made his will so early as 25 June 1545, in which he stiles himself Sir Richard Williams, otherwise called Sir Richard Cromwell, knt. and of his majesty’s privy chamber; he directed that his body should be buried in the place where he should die; and devises his estates in the counties of Cambridge, Huntingdon, Lincoln, and Bedford, to his eldest son Henry, with the sum of £500 to purchase him necessary furniture, when he should come of age: his estates in Glamorganshire he devises to his son Francis and bequeathed £300 to each of his nieces, Joan, and Ann, daughters of his brother, Walter Cromwell; and directed, that if Thomas Wingfield; then Sir Richard’s ward, should chose to marry either of them, he should have his wardship remitted to him, therwise the same should be sold. He also left three of his best great horses to the king, and one other great horse to Lord Cromwell, after the king had chosen: legacies were also left to Sir John Williams, knight. and sir Edward North, knight. chancellor of the court of augmentation; and to several other persons, who seem to have been servants: Gab. Donne, clerk, Andrew Judde, William Coke, Philip Lentall, and Richard Servington, were appointed executors. The will was proved 28 Nov 1546. 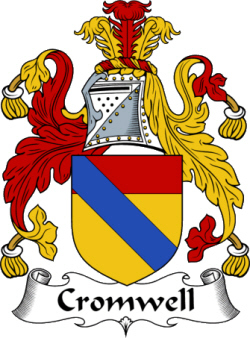 Sir Richard’s father and Alex’s 14th great grandfather was Morgan WILLIAMS was born about 1469 at Glamorganshire, Wales . His parents were William WILLIAMS and Joan TUDOR. He married Catherine CROMWELL, daughter of Walter CROMWELL about 1494 in Putney Vale, Surrey, England. I remember Catherine was a sympathetic older sister in and Walter was an abusive father in Hillary Mantel’s novel Wolf Hall. The family was far from rich. Morgan Williams was an ale brewer and innkeeper at Putney, Surrey, England. Putney is a district in south-west London, England, located in the London Borough of Wandsworth. It is situated 5.1 miles (8.2 km) south-west of Charing Cross. 2. Francis Williams, alias Cromwell, esq. Francis was one of the Knights of the Shire for the county of Huntingdon, in the 15th year of the reign of Queen Elizabeth I, and for the counties of Huntingdon and Cambridge, in the 29th year the same reign; at which time, according to Fuller, he resided at Hinchinbrook; but his usual place of residence was at Hinchinford, in Huntingdonshire. He married Margaret the daughter of Henry Mannock, of that place, and died 4 August 1598. Francis was knighted, served as MP for the county of Huntingdon in 1573 and was in turn High Sheriff of Hunts and Cambs. Francis’ son Henry entered Queens’ in 1580 at the age of 15. Little is known of this Henry Cromwell, except that he was a moderately wealthy country gentleman and fathered a son Richard who went up to Jesus College in 1619. This entry was posted in Artistic Representation, Historical Site, Line - Shaw, Storied, Tavern Keeper, Wikipedia Famous. Bookmark the permalink. Kenneth… and who would that be ? Where is the proof that that Morgan Williams is supposed to be the 2nd GGF of Roger Williams ? I’ve never heard this until recently . I can find no proof of this. Do anyone have any knowledge of this ? I could truly use some help with the pleather of info on the internet and vast amounts of difference of birth and death dates for the Williams’/Cromwell line. Sharon according to wills and land records in North Carolina Rodger Williams marriage to Joan Williams. This Rodger his father was Sydrack brother of Rodger Williams Governor of Rhode Island yes Morgan was his ancestor and this is a quick break down Ap is son of, Rodger Ap James Ap Mark Ap James Ap Walter Ap Morgan . A lot of this Research was done by my ancestors and was given to me by my Father we keep great family records but with the internet makes it easy to read and find books written about the Williams/ Crowmwell family. Hello – I have also been linked to Rodger Williams of Rhode Island; however, I have questioned it, because my recent lineage is out of North Carolina. Seeing your post from 4/2016 is the first link connecting Rodger Williams to North Carolina. Could you offer more information or links that may further prove this connection? Any information would be greatly appreciated.